While you might not think about it a lot when it comes to having a lush green lawn that is healthy, how much would that be worth to you? After all, in order to ensure that a lawn is all of these things, it takes quite a bit of maintenance and hard work. If we were talking about your home, you may not be able to understand the importance of a healthy lawn that much. However, when it comes to owning a business, having a healthy lawn is part of your brand. It shows potential customers that you have all of your bases covered. It shows that you put thought into even the smallest of details and that you take pride in your company. This is just one of the many benefits of having a commercial sprinkler system installed by a professional New Jersey team. Continue reading below to learn more about how this decision can change your business for the better. When you make an investment of any kind, it is important that you maximize your return as much as possible, right? 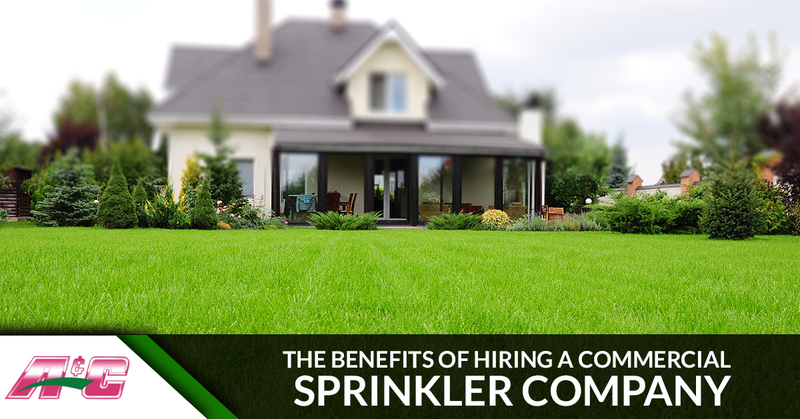 When it comes to sprinkler systems, however, you need to realize one very important thing: you get what you pay for. The more you invest in your commercial sprinkler system now, the more reliable it will be as it ages. Don’t get us wrong, you can always choose to get the job done in a quick and dirty manner, but you will be regretting it later without a doubt. After all, you’re going to have to pay for multiple repairs, again and again, to keep this sub-par irrigation system running. We know that it is tempting to cut corners in the beginning, especially when you don’t know whether or not the rewards you will be reaping will even be worth it. So what do you get when you choose a high-quality commercial sprinkler system over a lower performing model or an unexperienced sprinkler company? You get the very best parts, an expert to complete installation, and unending support when it comes to tending to your irrigation system. Without this, you and your lawn will likely be fighting some pretty annoying battles for months or even years to come. At A&C Sprinkler, our technicians are the professionals you need to assist you. Our team works with commercial sprinklers all day, every day. This means we can solve any issue that may arise during installation or thereafter. Additionally, let’s say something happens to a part of your sprinkler system a week after it has been installed. Maybe someone walking through your commercial lawn steps on a sprinkler head and breaks it. Don’t worry! We can come help you to replace it in no time at all. Where Can You Get The Best For Commercial Sprinkler Installation? While we wish we could say that this in-depth service and commitment to customers spans all sprinkler companies, this isn’t necessarily the case. Since service truly does vary during everything from installation to maintenance, we can only suggest that you choose the very best in all of New Jersey. We’re talking about A&C Sprinklers, of course. Call us today and find out how much it would cost to have a commercial sprinkler system installed in your lawn. We promise that you will not find service like this anywhere else! Learn More About Commercial Sprinkler Installation Here!